Driveshaft International specializes in providing high quality driveshafts at an affordable price. Our products are American Made, in Denver Colorado, and we have been providing superior parts and service for over 35 years. At Driveshaft International’s state-of-the-art facility, our experienced staff can re-manufacture or custom build high quality driveshafts. The driveshaft service is done in one day from the time we get the shaft. We offer free estimates for all our services. Don’t buy an inferior product for more money! Driveshaft International guarantees its products and has built its industry leading reputation on our quality products and service. Seamless Carbon Mechanical Tubing we use are straighter, rounder, and more well built than the cold rolled tubing common in original equipment. Computer-assisted design programs are used to predict critical speeds that determine allowable shaft lengths. 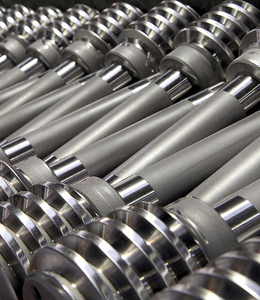 All shafts are custom using the finest blend of components to meet the demands of each application. Each shaft guarantees a proper centerline of rotation based on the shaft’s universal joints. This proper centerline alignment allows shaft run-out tolerances to one-half or less of those required by original equipment manufacturers. Our low tolerance provides for superior accuracy in shaft balancing resulting in a smoother run throughout all RPM ranges. Aluminum Driveshafts are manufactured from custom drawn 6061-T6 D.O.M. aluminum tubes for reliable strength utilizing 6061-T6 aluminum forged weld yokes for fortified grain structure. Internal stress induced by the machining process is reduced by working with the grain structure resulting in a more resilient product. Our “State of the art” welding processes enhance this reliability. Carbon Fiber driveshafts are custom built. This product is used significantly in heavy-duty applications or where extreme vibrations could tear down a metal shaft. In the event you should have a component malfunction, a carbon fiber driveshaft will shred itself rather than cause substantial damage to the vehicle. Our wet filament wound carbon fiber (with no metal substrate) allows longer unsupported spans than are feasible with metal tubes. A Carbon Fiber driveshaft has superior torque capacity and a longer fatigue life than a steel or aluminum tube.The shaft reduces vibration common to overdrive equipment vehicles significantly. Heavy Trucks, Diesel Tractors, Refuse Trucks, etc. where a lot of stress is encountered under heavy loads or quick power applications, it’s also essential for auto and heavy dynamometers.